Come for the 200 Belgian beers and stay for the hard-to-match pub cuisine. 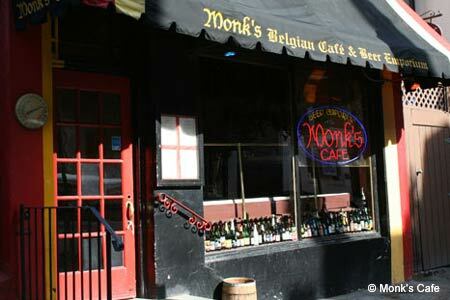 : A pioneer on Philly's ever-developing beer scene, Monk's is a good spot to quash a serious thirst. Many dishes are prepared with some sort of beer; even the mac ‘n’ cheese is spiked with weissebeir-braised ham. Grilled salmon is topped with white beer beurre blanc and rainbow trout comes pan-seared with bacon, pearl onions, capers and Saison Dupont. Mussels are flavored with everything from red curry to bacon and blue cheese. When it comes to burgers and a myriad of toppings, though, there’s no tampering. Smoked salmon sliders are on the lighter side, and for the brave: Spanish flies --- incendiary wings.